Washington state marijuana businesses won’t have a government-run seed-to-sale tracking program for at least another month, causing industry insiders to worry that the prolonged delay could lead to diversion and other compliance issues. The state’s Liquor and Cannabis Board was planning to implement Denver-based MJ Freeway’s Leaf Data Systems on Jan. 1 but instead has delayed the target rollout date to Feb. 1. Part of the problem is that only four of the software integrators are ready to work with Leaf Data Systems. The integrators are third-party providers that help retailers or producer/processors track sales and production data, which will be uploaded into the state traceability system. As a result, the cannabis board was forced for a second time to delay the new seed-to-sale system. BioTrackTHC – which had the state contract for four years – and the cannabis board were unable to come to terms on an extension, and the agreement ended Oct. 31. But Leaf Data Systems wasn’t ready to go Nov. 1. So the state issued a contingency plan in which licensees were required to manually submit traceability data each week to the state until Jan. 1. Essentially, the state asked businesses to follow the honor system. Some license holders are concerned the seed-to-sale program’s holdup could compromise the state’s industry. “It produces significant existential risk for the system,” said Logan Bowers, co-owner of Seattle retail shop Hashtag Cannabis and a member of the state’s Traceability Advisory Group. The Liquor and Cannabis Board’s number one concern on this project is our licensees. Based on discussions with our vendor – MJ Freeway – and internally with our project steering committee, we have elected to extend the preparation period to ensure the system is ready and your transition is as smooth as possible. Jan. 8: Last day for third-party integrators to submit tickets for system changes for the initial release. Jan. 14: Last day for the cannabis board and vendors to make changes to the traceability program. 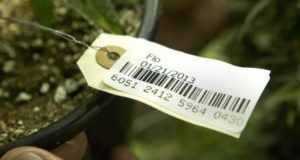 Feb. 1: Leaf Data Systems will go live for traceability at 12:01 a.m.
Feb. 15: Last day for current plants and inventory to be uploaded into the new system. March 2: Last day for lab results to be added into the system. With 1,100 licensed cultivators, Washington state is facing a glut of marijuana. Industry watchers say there are far too many producers and retailers per capita. Add in the lack of a statewide traceability system, and there’s an increased likelihood of diversion. “Most licensees are underwater with a high-value product they can ship out of state,” Bowers said. During the recent traceability advisory meeting, Bowers said the group was told that Leaf Data Systems had six “blockers,” or issues, that prevented the system from going live. When Jan. 1 rolled around, the rest of the potentially 15 integrators were not in a position to use the new software. Had the cannabis board launched Leaf Data Systems at that time, most licensees would not have been able to run their businesses. “Both pieces matter. Even if the software isn’t working, if no one talks to it, then that doesn’t really work,” Bowers said. MJ Freeway spokeswoman Jeannette Ward said the delay will give licensees time to become familiar with the new system. In the meantime, everything continues as it had since BioTrackTHC’s contract with the state expired. Licensees will continue to use the cannabis board’s contingency plan in conjunction with the stopgap measure BioTrackTHC provided. Though BioTrackTHC has been charging each licensee $50 a month to use its backup traceability system, Bowers said his company isn’t incurring any additional costs from the temporary setup. Green Bits – the POS system used by Hashtag Cannabis – is subsidizing the cost of maintaining the contingency plan. Ben Curren, CEO of Green Bits, said his company has more than 350 customers in Washington state. He estimates this delay is costing him more than $15,000 in BioTrackTHC fees plus an added $30,000-$35,000 in labor costs for his software engineers. “Hey, it’s the cost of doing business and all, but this is the second time they’re doing this,” he added. Steve Fuhr – owner of Toucan Farms, a producer/processor in Shelton – said the manual system he’s been using in the interim period has been working just fine. And that brings into question the necessity of a state traceability system. “It’s free, and it’s working better than the last one,” added Fuhr, who also is a member of the advisory committee. But he also pointed out that, under the contingency plan, the cannabis board doesn’t have the same audit controls it had before. Washington continues to prove itself as one of the most corrupt, wasteful, and incompetent state’s in the union. All government is corrupt, wasteful and incompetent — be it state or federal. It is only a matter of degree. The government that governs least, governs best. I believe Washington State, with its socialistic tendencies, is probably worse than many.